In 2011, 3 million recent movers who were previously homeowners became renters, according to a Pew Research Center analysis of the Census Bureau’s American Housing Survey data. This is substantially greater than the flow into renter status observed in 2001, when 2.56 million prior homeowners became renters. 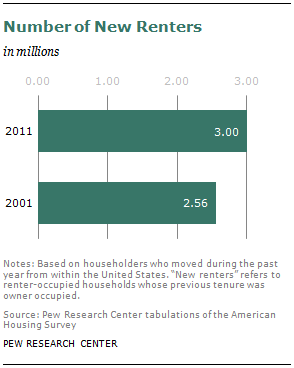 In 2001, 34 out of every 1,000 eligible homeowners became renters over the prior year. By 2011, the new renter rate ticked up to 38 per 1,000 eligible. The increased movement from homeownership to renting was concentrated among younger households, though not exclusively households younger than 35. In 2001, 123 out of every 1,000 eligible young adult homeowners became renters over the prior year. By 2011, the new renter rate among young adult homeowners had increased to 139. The new renter rate is much lower among households 35 and older and did not increase as much over the decade.